Mother Petra was born on 14th June 1924, at Oelde in Germany and was baptized on 18th June 1924 at St. John the Baptist Church Oelde and was named Paula Katherine. The parents of Mother Petra were Bernard Moennigmann and Paula. Her family was rich. She was taught by her mother to offer little sacrifices and bear the inconveniences of life for the love of Jesus and for the souls in purgatory when she was small. Even as a child she had keen attention on those who suffer and she really felt sympathy for the sufferers. Mother Petra was an extra ordinary woman with a firmness of character, with clearness of vision and strength of will power. Even though Mother Petra was not a trained nurse, she learned from practice the art of nursing and she had a special Charism in the healing apostolate. She found everywhere sickness and poverty and her heart went out in sympathy for the poor and the suffering. One could feel and notice something of Jesus in her. The same sympathy of Jesus, the same self donation and concern for others reflected in her entire life. One could rightly say that Jesus was walking anew the streets of the world in Sr. Petra. She was most devoted to the passion of Christ. It is evident in her writings of �Excurses� to her daughters. She literary lived her name �Sr. Petra of the Holy Cross� which she had taken on her final vows at Ursuline Congregation in Germany. She had a great longing to be with the Eucharistic Lord and she participates in the Holy Mass and adore the Blessed Sacrament. She decided to reduce the sufferings of the Crucified Lord and console Him by her love, penance and suffering. The spiritual communion of Mother Petra with the Lord in the Holy Eucharist and her contemplation of the holy face of Jesus on the cross enabled her to see the disfigured face of Christ in the poor whom she served. Her trust in the providence of God was remarkable and unshakable. Her encounter with Jesus in the Blessed Sacrament instilled in her an ardent desire to sacrifice her life for the poor. Physical ailments were constant companion of Mother Petra. In addition to the physical hardships, the extreme poverty and poor life style converted her life into a perpetual holocaust, a living sacrifice. Yet she rarely complained about her sufferings. She used to write letters to Jesus daily. Another conspicuous feature of Mother Petra�s life and activities was a profound trust in the providence of God. Like Abraham, the patriarch, she relied totally on the loving providence of the Heavenly Father. Many things appeared to her humanly impossible. Her problems of health threatened her cherished plans and goals. At times she was lost in darkness and gloom. Yet she cast herself in the guiding hands of God. Mother Petra lived a life of poverty. 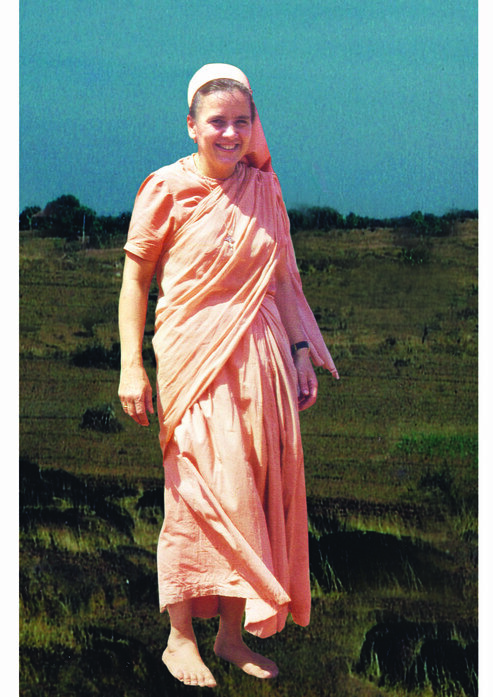 Very often she walked barefoot on the rough and stony ground of Pattuvam. Bearing the scorching heat of the day, sweating profusely, drenched in the pouring rain she worked tirelessly, without complaint, with an air of joy, satisfaction and a thrill in undergoing hardships. She lived a very frugal and parsimonial life. She after having given up heroically all the comforts of a European life of affluence, she adopted rigorous poverty in order to enrich her fellow beings in India. By her frugality she could earn something as balance in order to be used for the poor. In this she almost reflected Jesus Christ, the Son of God �who though was rich made Himself poor in order to make us rich by his poverty�. She was also a peace � maker. Mother Petra had a special Charism to bring about peace and reconciliation. She herself was tolerant and generous that she would forgive any offence and welcome any offender. In 2007, Rt. Rev. 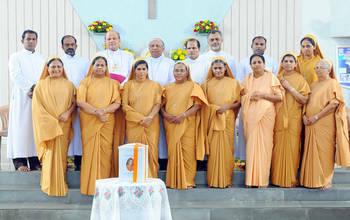 Dr. Varghese Chakkalackal, the then Bishop of the Diocese of Kannur, print and published the prayer for her Canonization. In 1994 the first Biography was written by Rev. Dr. Augustine Kolencherry SAC, �Mother Petra, Lover of the poor� (Story of an Immolation). The petitions of those who prayed the Canonization Prayer were granted. The Closing ceremony of the Diocesan Inquiry concerning the life and virtues of the Servant of God Sr. Petra Dinadasi Moennigmann, the Foundress of the Dinasevanasabha was held on Wednesday 1st June 2016, on the 48th foundation day of the Congregation at DSS Snehaniketan Ashram Chapel, Pattuvam. The ceremony was officiated and inaugurated by His Excellency Most. Rev. Dr. Alex Vadakumthala, the Bishop of the diocese of Kannur. Sr. Daniela, the Superior General of Dinasevanasabha welcomed all. His Excellency Most. Rev. Dr. Varghese Chakkalakal, the Bishop of the diocese of Calicut addressed the gathering and delivered the message of the day. A large number of priests, religious and faithful witnessed this great event. The dossier was handed over to Sr.Vandana DSS, the Postulator to be sent to the Congregation for the Causes of Saints, Vatican City. With this His Excellency Most. Rev. Dr. Alex Vadakumthala declared the closing of the Diocesan Inquiry. Rev. Sr. Berthalomia DSS, the former Superior General, thanked all the dignitaries and the gathering. The Congregation for the Causes of saints in Rome received the dossier on December 5, 2016. Rev. Rev. Dr. Cherian Thunduparampil CMI was appointed as the Postulator in Rome and Sr. Deepa DSS was appointed as the External Collaborator to the Postulator. Sr. Vandana DSS is the Vice Postulator and Sr. Sudaya DSS is the Financial Administrator. Rev. Dr. Paul Pallath is the relator of the Canonization process of Mother Petra. The Decree of Validity of the Diocesan Process was issued in December 2017.